Koskenkorva vodka has the U.S market in it’s sights. Produced by government owned Finnish distillery, Altia Ovi, Koskenkorva is distilled in a small village in the northern Finnish Countryside. The distillery believe that Koskenkorva is in a strong position to go up against Smirnoff and Absolut in the American on-trade. “There’s a huge craft boom in strong spirits,” said Chief Executive Officer Pekka Tennila. 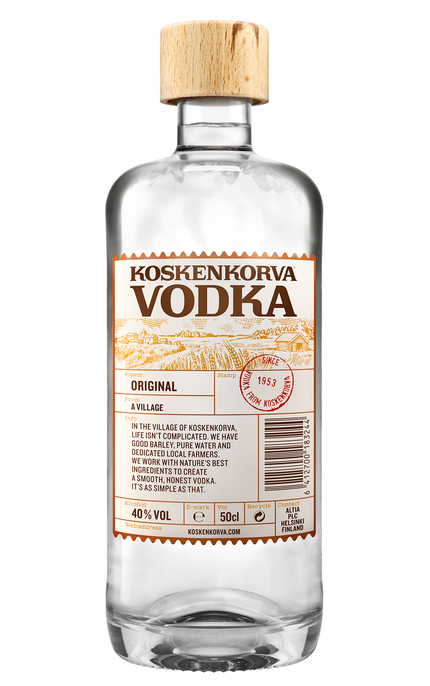 Koskenkorva is viewed as a ‘craft’ vodka in the U.S, in part due to it’s genuine provenance. In production since 1953, the spirit has been a best seller in Finland for ‘decades’. “People are shifting from global giants to smaller, local distillers that come with a story”. Currently on sale in 30 countries and already enjoying some success in the U.S, Altia say their plan to expand in the U.S will be implemented in a number of ways. Together with U.S partner Infinium Spirits Inc they are increasing their distribution network and focusing marketing efforts on creating greater exposure for the vodka brand. Altia say the expansion plans will be funded in part by selling shares in the distiller on the main list of the Helsinki stock exchange. An initial public offering as well as the sale of some state held shares will make up the listing, with Altia intending to hold onto a 34 percent stake. “Altia wants to use proceeds for expansion, both organically and through acquisitions” said Tennila. An offer to the state to purchase the company was rejected without even being looked at said Economy Minister Mika Lintila. “We want to give the Finnish people a chance to buy a slice of the vodka distillery” he said. As of yet, no financial information of the planned share sales has been publicly released.